For astrological purposes the planet Mars is referred to for an indication of an individual's probable energy, drive and aggression levels. Its inclusion and position in a person's birth chart will reveal their physical and mental motivation and shortness of temper. Mars rotates completely once around every two years so its influence is predominant but not overly so. Its significance in a horoscope interpretation however is fairly important as Mars's influences can directly affect someone's mannerisms. The positioning of Mars when a person is born it is believed to be partly responsible for their possible personal power and optimism in life. This knowledge can be used to make associations with all the other revealed identified traits. 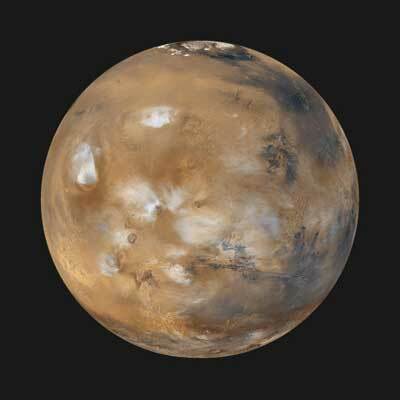 Mars is the fourth planet from the Sun and is often known as the Red planet due to its iron oxide rich surface. In most cultures this particular globe is referenced as a war planet after Mars the Roman God of War. Like the Earth this planet has seasonal tilts on its axis during its two yearly cycle. 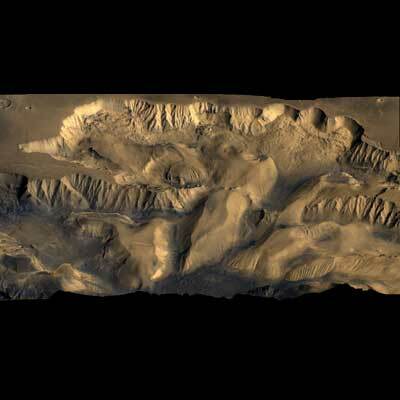 Mars has a varied landscape that shows that in the past its environment showed indications of Earth like mountains and valleys as well as Moon like rocky craters. The Astrology connection with Mars centers around the energetic and aggressive forces within its mythical warlike reputation. It makes it easy to remember the significance of its revelations in terms of authority on a person's fight and defenses. The mythological portrayal of Mars is kept alive by the telling of stories from the past. 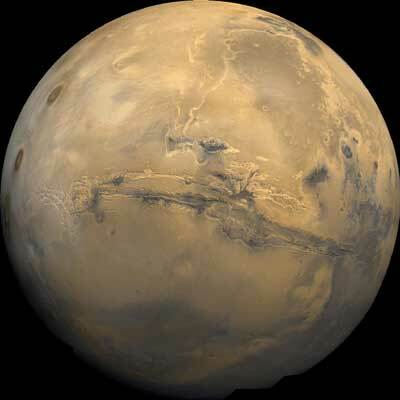 A few well known myths from the Hindu's, Babylonians, Greeks and Romans refer to Mars as a planet of War. In Hindu mythology the God of War was Karttikeya, in Babylon he was Nergal and the Greek God Ares later became the Roman God Mars. These ancient people all looked towards this planetary presence for security and peaceful times. The Mayans were possibly the only culture that viewed Mars differently as they did not consider it to be a war focused place. Instead they imagined Mars to be just one of the planets they frequently observed in order to help predict future events. The Roman God of War is probably the best known and there are many references to him through out history. The God Mars is said to have had a relationship with the Goddess Venus and their sons Romulus and Remus are thought to have founded the city of Rome. The Romans believed that Mars would protect his offspring and so in times of crisis they would place confidence in him to keep them safe. All these passed down legends have helped forge a strong memorable image of the influential forces of the planet Mars. To recall its meaning for horoscope analysis we simply have to remember the fortitude of the War God and his energy and determination. This will then remind us that the Mars position suggests a person's will to achieve and their degree of courage. The positioning of Mars in an individual's natal chart can reveal their satisfaction levels in many areas. It will possibly uncover their level of ambitiousness, inspiration and personal energy and drive. When this is considered alongside other planet and star influenced characteristics it assists in giving a clearer picture of a personality. The influence of Mars highlights the gratification of natural instincts and shows a person's ability to get things done. It may appear as an indication of negative destruction but is much more better described as a power of positive construction. Mars is thought to instill positivity and strength of the body and mind in all that it influences and include evenly in people and situations. Symbolically in Astrology and for horoscope use Mars is represented by an icon consisting of a circle and an arrow. It is meant to signify the shield and spear of Man and is excellent at reminding us of its meaning and significance, The circle is regarded as divine spirit and the arrow is assumed to be aim and force. The combined symbol is easily identified on the charting of a birth. The positions it appears in will benefit from its energetic action initiating forces. Mars positions can indicate a lot about a person's impulses and spontaneity. This is useful information especially when assessing personal suitability for jobs or relationships. Mars is ruled by the Western Sun Sign Aries and this adds a practical element to its legendary combative image. This is one of the reasons that Mars is seen as less destructive and more constructive. Mars's location in an Astrology chart still signifies aggression type tendencies but these hostilities include practicality and so are more indicators of optimism and confidence. Pinpointing this planet's bearings at the time of birth can disclose the strength and perseverance of a person's overall character. The mosaic of Mars you would see only from a spacecraft. The center of the scene shows the entire Valles Marineris canyon system, over 4000 km (2486 mi) long and up to 7 km (5 mi) deep. It extends from Noctis Labyrinthus, the arcuate system of graben on the west side, to the chaotic terrain on the east side. Many ancient river channels begin from the chaotic terrain and north-central canyons and run north. Three Tharsis volcanoes can be visible to the west (dark red spots). They rise 10 to 18 km (6 to 11 mi) above the Tharsis Plateau, attaining elevations of 18 to 26 km (11 to 16 mi). The 15-km (9-mi) diameter Deimos circles Mars every 30 hours. Scientists speculate that Deimos and its companion moon Phobos were once passing asteroids that were pulled in by the gravity of Mars. 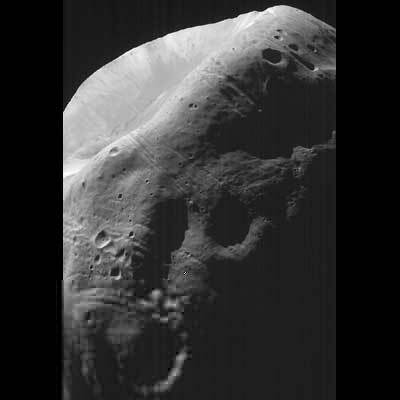 The Mars Global Surveyor Thermal Emission Spectrometer (TES) measured the brightness of thermal radiation at the same time the camera acquired this image of Phobos. This preliminary analysis shows that the surface temperature, dependent on slope and particle size, varies from a high of +25 F (-4 C) on the most illuminated slopes to -170 F (-112 C) in shadows. This large difference, and the fact that such differences can be found in close proximity, adds support to the notion that the surface of Phobos is covered by very small particles. Stickney, 10 kilometers (6 miles) in diameter, shows individual boulders near the rim of the crater. Some of these boulders are enormous - more than 50 meters (160 feet) across. Also crossing at and near the rim of Stickney are shallow, elongated depressions called grooves. 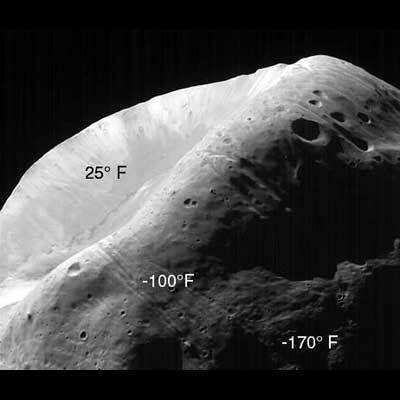 This crater is nearly half the size of Phobos and these grooves may be fractures caused by its formation. 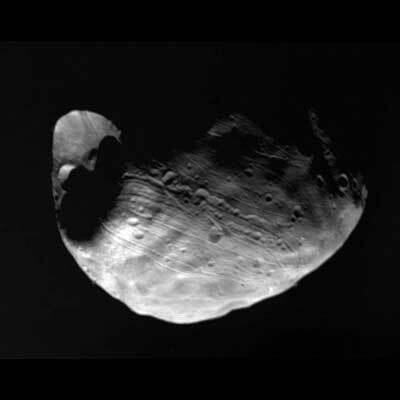 This image of Phobos, the inner and larger of the two moons of Mars, was taken by the Mars Global Surveyor on August 19, 1998. A large crack, oriented from lower left to upper right, is visible in the rock. 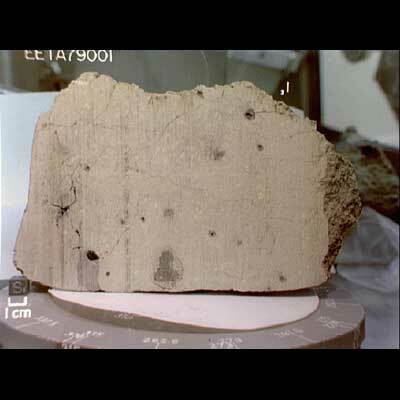 A dark crust appears to cover Chimp in some areas whereas other parts of the rock have lighter shading. A boundary between the two regions is clearly seen in the upper left part of Chimp. 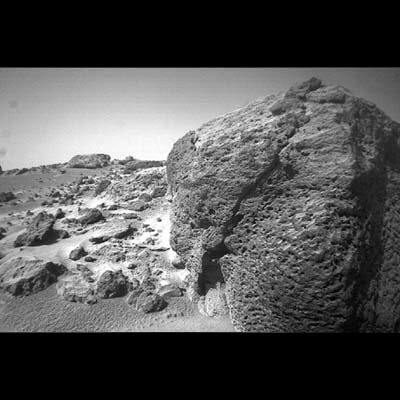 The large rock dubbed "Pooh Bear" is at far left of the Martian terrain. Mermaid Dune is the smooth area stretching horizontally across the top quarter of the image. 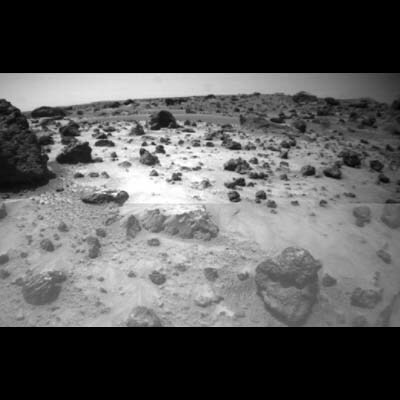 The Mars Pathfinder Alpha Proton X-Ray Spectrometer (APXS) instrument aboard Sojourner was later deployed on Mermaid Dune, and the rover wheels exposed dark material beneath the dune surface. 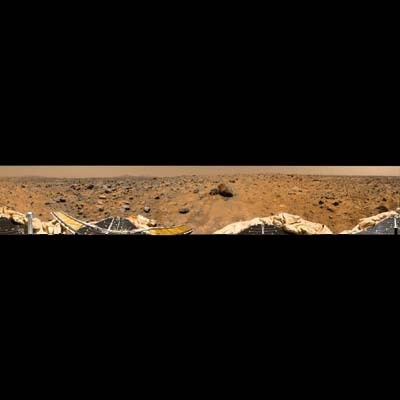 This Mars Pathfinder panorama captures different regions imaged at various times over three Martian days to acquire consistent lighting and shadow conditions. On the horizon, the ‘Twin Peaks'are visible. In the left foreground is a Lander petal and a metallic mast which is a portion of the low-gain antenna. Another Lander petal is at left-center, showing the fully deployed forward ramp at far left, and rear ramp at right, which the Sojourner rover used to descend to the surface of Mars on July 5, 1997. Deflated airbags are visible at the perimeter of all three Lander petals. Rover tracks lead from the rear ramp to Sojourner, shown using its Alpha Proton X-Ray Spectrometer (APXS) instrument to study the large rock ‘Yogi'. ars is the Roman god of war and also of agriculture. He was very important to the Romans because he was the father of Romulus and Remus, the mythical founders of Rome. In the beginning Mars was seen as more of an agricultural or pastoral god, this still had relevance, even after he became more and more associated with war. Mars was the son of Juno, Jupiter's wife. Jupiter had given rise to the goddess Minerva by birthing her through his head. Juno was jealous of this event, and asked the goddess Flora to help her in the task of creating a son. Flora, the goddess of blossoming plants touched Juno with magical herbs and created Mars in her womb. Mars raped the vestal virgin Rhea Silvia while she slept, she gave birth to twins called Romulus and Remus. Rhea was imprisoned because of the sacred laws of her vows, and her sons were left in baskets on the river. They were brought up by wolves and eventually founded Rome. Mars was often depicted riding a two-horse chariot, with a spear and a shield, both items with magical properties. His shield in particular was an important object and symbol for the Romans, according to legend one is said to have fallen from the sky to save the Romans during battle. Sacred shields were kept in the temples of Mars and the one alleged to have fallen from the sky was reserved for the Forum, where it was said to guard Rome from attack. Primarily Mars was invoked for battle and all things associated with war. For obvious reasons he was a favourite among soldiers in the Roman army. Communications and transportation are speeded up this morning, but run into snags this afternoon. The evening is an ideal time for small-scale socializing in your own home. You may suddenly find yourself restless today. Two family members will suggest excellent practical benefits and ideas regarding home improvement. As a result of something that happened or didn't happen last night, you may be a little uptight about love matters this morning. Phone conversations with intimate friends can ease your worries. People can be difficult from time to time, but the secret to dealing with them successfully today is to treat everyone as special. Long-distance travel is not favored, but you are safe within a ten-mile radius before dark. Check up on what has and hasn't been done this morning. Ignore any negativism by someone who is envious, but concentrate upon the positive, especially as it affects production. A lover's spat could find you in the doldrums as this day begins. You are very conscious of everything connected with love.